I was watching a movie with my children when the subject of tornadoes came up. Answering their questions, I realized I was a bit rusty on my knowledge of everything concerning tornadoes, so we decided to do a little research to help us better prepare in the case of a tornado. What exactly is a tornado? A tornado is made of wind. In a tornado, the wind is rotating in a vortex or column. This can uproot trees, sweep up houses, and cause a great deal of destruction. Similar to tornadoes are straight line winds. Straight line winds have the fast speeds of tornadoes without the rotations. They can be just as deadly. Most tornadoes are very short-lived and cause only weak damage with winds under 110 mph. Strong tornadoes last more than 20 minutes with wind speeds up to 200 mph. Only a small number of tornadoes are considered violent tornadoes, lasting up to an hour with wind speeds greater than 300 mph. What is a Tornado Watch? If a tornado watch is called in your area, it means that conditions may cause tornadoes to form but no tornadoes have been spotted. Keep an eye on the weather and listen for any further reports. What is a Tornado Warning? A tornado warning means that a tornado has been spotted. You should take cover immediately. Tornadoes can strike quickly, giving very little warning. Being prepared and going over emergency procedures can help children feel more secure. Speak with all family members and plan where you will go in the event of a tornado. You should choose the safest location in your home. This is generally the lower level of your home, away from windows and doors. Choose an interior room or wall and take shelter under heavy furniture when possible. If you are in your vehicle, leave the vehicle and lay flat in a lower area such as a ditch. In the event of a tornado, do not open windows or doors, as this can allow debris and wind to sweep into the home. Discuss ways that family members can prepare and reach the emergency location quickly. Non-perishable food. Pack enough non-perishable food for everyone in your household for three days. Stay away from salty foods and anything which increases thirst. If you pack canned goods, don’t forget to include a can opener. Water. Have enough drinking water for everyone in your household for 3 days. You may want to include extra for sanitation. Consider one gallon per person per day as your starting point. Light. In the event of a power outage, you may be without light. Pack candles and/or a flashlight or lantern. remember to include a way to light the candles or extra batteries. Weather radio. Pick up an inexpensive battery operated or hand-crank weather radio to keep update on emergency weather conditions. First aid kit. Have a first aid kit easily accessible in the event that someone is hurt. Help signal. Include some way to signal others in the event that your home is destroyed. A signal whistle, horn, or flare gun may help alert others to your location. Disposable wipes. Disposable wipes can be used for sanitation if you are confined to your location while waiting for help. Duct tape. You never know when you may need duct tape. Emergency information. Check out this handy information page that you can print out. Pet supplies. If you have pets, pack some non-perishable pet food and possibly an emergency leash. Poo bags may also come in handy. Trash bags. These can be used as makeshift toilets. Entertainment. Consider packing some books, paper, crayons, or other items to help take children’s minds off of the storm. Blankets or pillows to keep warm and sleep. Any medications required by family members. Extra eye glasses or other health care items. Here is a printable checklist to help your family gather supplies for your kit. Check out Tornadoes AHEAD: Owlie Skywarn’s Weather Book. This is a free printable coloring book with facts and other information regarding tornadoes. The Cat in the Hat and various other Seuss characters are travelling in a hot air balloon where they encounter many types of weather. Make storms a little less scary by reading about what causes them. 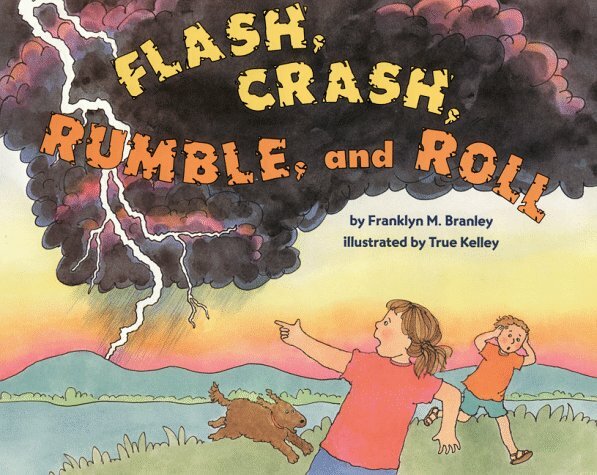 DK provides a valuable reference for children with their book on weather. Beautiful color photgraphy combined with clear information help demystify weather for families. For the slightly older child, check out DK Eyewitness Books: Weather This book covers the same topics with more depth. So important to have a plan! !